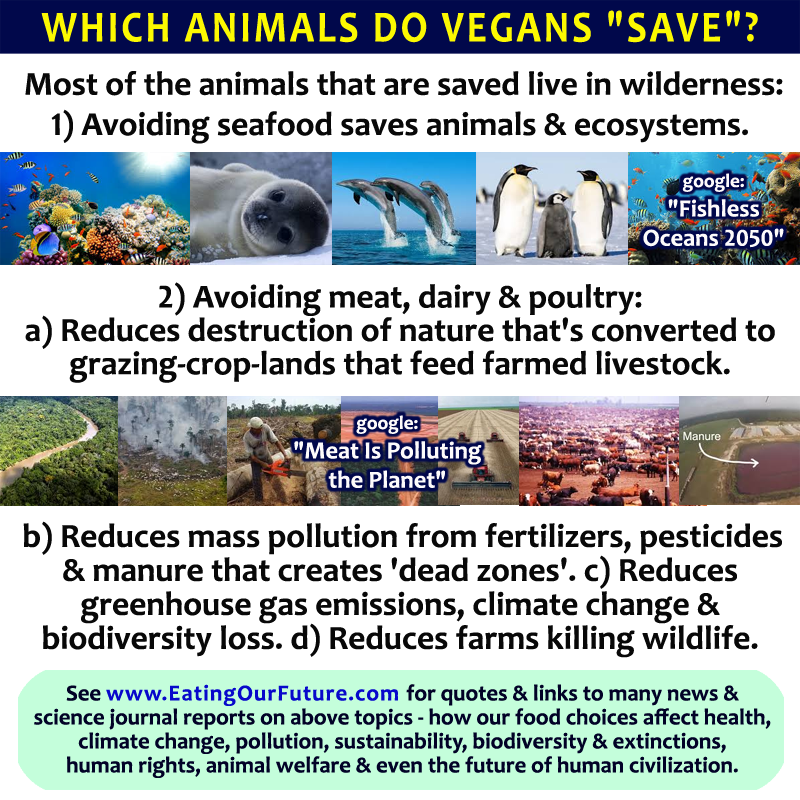 Page Summary: Quotes & Links for 40+ Science News Reports on the Current Sixth Mass Extinction; on the Pivotal Role of our Food Choices; of How this Loss of Biodiversity Threatens Human Sustainability & Civilization. This site also has a page with 40+ reports on the dying oceans. 2018 news report in The Guardian: “Humanity has wiped out 60% of mammals, birds, fish and reptiles since 1970, leading the world’s foremost experts to warn that the annihilation of wildlife is now an emergency that threatens civilisation. Some examples are obvious: without plants there would be no oxygen and without bees to pollinate there would be no fruit or nuts. From a 2017 news report in The Guardian (UK) titled “INSECTAGEDDON: FARMING IS MORE CATASTROPHIC THAN CLIMATE BREAKDOWN” – Excerpts: “The shocking collapse of insect populations hints at a global ecological meltdown. As a UN report published in March explained, the notion that pesticide use is essential for feeding a growing population is a myth. A recent study in Nature Plants reveals that most farms would increase production if they cut their use of pesticides. A study in the journal Arthropod-Plant Interactions shows that the more neonicotinoid pesticides were used to treat rapeseed crops, the more their yield declines. Why? Because the pesticides harm or kill the pollinators on which the crop depends. 3. We need firm rules based on the outcomes of these assessments, obliging those who use the land to protect and restore the ecosystems on which we all depend. Excerpts: “human civilisation relies on biodiversity for its very existence. The plants, animals and microorganisms with which we share the Earth supply us with vital ecosystem services. species have been disappearing far faster than before. Since 1900, reptiles are vanishing 24 times faster, birds 34 times faster, mammals and fishes about 55 times faster, and amphibians 100 times faster than they have in the past. We also have to move urgently to slow human population growth, reduce over-consumption and over-hunting, save remaining wilderness areas, expand and better protect our nature reserves, invest in conserving critically endangered species, and vote for leaders who make these issues a priority. 2016 news report titled “World on track to lose two-thirds of wild animals by 2020, major report warns.” Excerpts: “Living Planet Index shows vertebrate populations are set to decline by 67% on 1970 levels unless urgent action is taken to reduce humanity’s impact… The number of wild animals living on Earth is set to fall by two-thirds by 2020, according to a new report, part of a mass extinction that is destroying the natural world upon which humanity depends. A 2016 article in The Independent (UK) titled “Half the world’s species failing to cope with global warming as Earth races towards its sixth mass extinction.” Excerpts: “Nearly half the species on the planet are failing to cope with global warming the world has already experienced, according to an alarming new study that suggests the sixth mass extinction of animal life in the Earth’s history could take place in as little as 50 years. while the Earth system had proven resilient, achieving millions of years of relative stability due to the complex interactions between the Earth’s core and the biosphere, human societies would be unlikely to fare so well. To make matters worse, the grain we feed animals is the leading driver of deforestation in the tropics. And it’s a hungry beast: our cows, pigs, and poultry devour over one-third of all crops we grow. Indeed, the grain we feed to animals in the U.S. alone could feed an additional 800 million people if it were eaten by us directly — more than the number of people currently living in hunger [globally]. But Dr Barrett stressed the situation was far from hopeless. This site contains pages with hundreds of science reports on: the higher rates of disease & death associated with eating red meat, dairy, chicken/poultry, eggs, fish/seafood; & of the improved health & longer lifespans associated with eating healthy plant-based diets featuring fruits & vegetables, nuts & soy; as well as on common nutritional deficiencies; of why so many doctors fail at nutrition; of how big business influences food politics; the evolution of human diets; & on the negative impact of animal agriculture on climate change, deforestation, fishless oceans, biodiversity loss, antibiotic-resistant superbugs; & more. A 2017 study titled “More than 75 percent decline over 27 years in total flying insect biomass in protected areas.” Excerpts: “Loss of insect diversity and abundance is expected to provoke cascading effects on food webs and to jeopardize ecosystem services... we used a standardized protocol to measure total insect biomass… over 27 years in 63 nature protection areas in Germany (96 unique location-year combinations)… Our analysis estimates a seasonal decline of 76%, and mid-summer decline of 82% in flying insect biomass over the 27 years of study. with 75 animal and plant species having gone extinct since human settlement. The once-vibrant bird life has fared particularly badly, with 90% of seabirds and 80% of shorebirds threatened with or at risk of extinction. Pastoralism based on introduced sheep and cattle is now the dominant land use across much of Australia, and many other introduced herbivores (notably including the rabbit, goat, donkey, camel, horse, and buffalo) collectively occur abundantly beyond the pastoral estate across the entire Australian land mass, including in many conservation reserves. Many of these diverse threatening factors directly or indirectly increase the intensity and impact of predation by feral cats and foxes. In many areas, shelter sites for native mammals (including hollow logs and dense ground vegetation) are reduced by the current fire regime and/or by grazing pressure of livestock and feral herbivores, allowing more effective hunting by feral predators. Our global carbon reserves – including coal, oil, oil shale, tar sands, gas and coal-seam gas – contain considerably more than 10,000 billion tonnes of carbon… This amount of carbon, if released into the atmosphere, is capable of raising atmospheric CO2 levels to higher than 1000ppm. Such a rise in atmospheric radiative forcing will be similar to that of the Paleocene-Eocene boundary thermal maximum (PETM), which happened about 55 million years-ago… But the rate of rise surpasses those of this thermal maximum by about ten times.